Pioneer Locksmiths is an authorised dealer of all major New Zealand manufacturers and suppliers. Our shop showcases a wide range of security products from Abloy, Abus, Borg, Carbine, Chubb, Doric, Ezi Set, Federal, Gainsborough, Interlock, Ingersoll Rand, Ilco, Kaba, Legge, Lockwood, Loksafe, Lucky Line, Master, Miles Nelson, Safeguard, Schlage, Securicraft, Sylvan, Union, Windsor, Whitco, Weiser, Yale etc. Door locks and handles, door guards/protectors and mortise lock. Special swimming pool gate locks, compliant to council regulations. Window catches, window stays and locks. Garage door locks, cam locks, filing cabinet locks, and locks for any purpose. 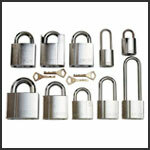 Specialist padlocks - for marine use, container use, TSA approved luggage locks (for US border security). We can provide one master key for a group of padlocks or make it keyed alike to your other keys or padlocks. Key organizers and accessories - key boxes, key safes, hiders, key tags, and split rings. Fire safes, home safe, cash boxes etc.